Maxi-Rollmax heaters are manufactured to the same construction design of the other Rollmax models. Its flat 4.5 x 8 mm cross-section can bear very high loads, with specific power of up to 8 W/cm² (20 W/linear cm). It is particularly fit for the heating of large plastic injection nozzles, as well as in the extension of metal die-casting machines. 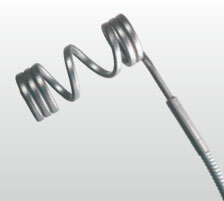 Its malleability lets shap-ing it in very complex patterns with narrow bending radiuses (down to 18 mm). When positioned in 4.6 mm-large, 8 mm-deep grooves, it is the best choice for the heating of hot chamber casting plates, providing the highest exchange surface. Other lenghts and powers on request.